Gimmicks are going to be around as long as there are guitars. They have their place in performances and have been iconic in the past. There comes a point, however, when any gimmick can get old. Townshend couldn't keep smashing his guitars forever (though it seems like Gene Simmons' tongue will never stay in his mouth). The following gimmicks are fairly prevalent in live performances, but have become blasé at this point. Try to eliminate them from your gigs to keep fans interested in your music and to erase any doubt that you're compensating for something. 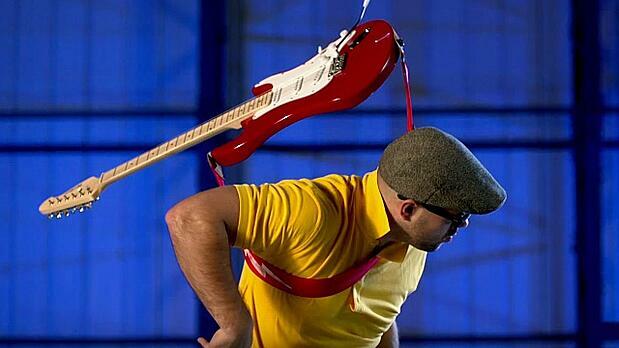 Swinging a guitar around your body has become an old trick at this point. Of course, that doesn't stop many guitarists from doing it at any opportunity. The flashy trick is nearly ubiquitous in some genres, but you're much better off learning a new scale than spending any time practicing this move. Audiences have seen this move so much that, at best, it'll get little more than a ho-hum response. At worst, you'll send your guitar flying and look irredeemably amateurish. Everyone knows that all it takes to pull this one off is some aftermarket strap pegs. Set yourself apart by using your guitar as an instrument and not as a hula hoop. Locking tremolo systems give your whammy bar great versatility while allowing your guitar to stay more or less in tune. Eddie Van Halen most famously blew minds with his aggressive dive bombs in 1984, more than 30 years ago, and Ike Turner had been using a similar tremolo technique years before Van Halen made it big. A tremolo can be a legitimate musical option when used with precision and restraint, but if every solo features a string-slacking dive, it's time to lay off a bit. Using a tremolo to make noise and not music is a surefire way to be labeled as a gimmicky player. The use of effects pedals is almost essential to playing electric guitar today. Most guitarists are bound to have a few at their disposal during any gig. Developing a sound based around one effect can be a good way to distinguish yourself for a while, but you should be cautious not to overdo it. For instance, the Edge from U2 is known for his signature use of digital delay. It helped catapult the Irish band to international superstardom. However, when it became clear he would be using delay song after song, album after album, and tour after tour, the sound became a little more grating than innovative. Fortunately for the Edge, U2 has become so successful that it would hardly dent their profits if he tried playing guitar with a hack saw. If you haven't reached that level of success yet (or even if you have), it may help to try to mix up your effects repertoire a little. Using the same scale for every solo is something that many guitarists get away with. Greats such as Angus Young (and countless others) made a career out of the minor blues scale. Even the legendary Yngwie Malmsteen leans heavily on the harmonic minor. No matter how good at guitar you become, branching out musically is a difficult but rewarding task. That's not to say that you should resolve to use the weirdest scales possible. (A perfectly executed solo in Hungarian minor will sound a bit strange even to the most knowledgeable musician, let alone a casual fan.) From song to song, you should do your best to use a sensible variety of modes and scales. It's the mark of a musician who puts thought and feeling behind notes rather than treading the same musical path over and over again. As a lead guitarist, you get a good portion of the spotlight during a gig. Like it or not, when you solo, you're representing the band as a whole. To present your team in the best light, don't rely on tired gimmicks like these to capture the fickle affection of an audience. Even if they work, the risk of being a flash in the pan is too great. Combine your natural showmanship with skill and innovation, and you'll get recognition as a musician and not merely as a performer. Matthew Wendler is a blogger and multi-instrumentalist from New Jersey. He specializes in guitar, bass guitar, and bagpipes, and is passionate about writing both professionally and for enjoyment. His personal blog can be followed on Twitter at @ymiatvmi.